I'll spare you the narration. Here's my take on the first round of the playoffs. Here are two teams going in the complete opposite direction; the Cavs are a young, energetic team on the rise with a player who's arguably the best basketball player to take the court since MJ last laced up. Detroit on the other hand, are a group of wily old vets that are still trying to maintain their gritty swagger despite having just experienced one of their worst regular seasons. As much as I hate voting against the home team, the Cavs will come out on top. Cleveland in 6. This is going to be a dangerous round for the defending champs; the Celtics are forced to begin their title defense without the anchor: Kevin Garnett. Though they've already played over a month without him, I'm not convinced that they're a sure thing. Chicago, winner of 5 of their last 6, are rapidly gaining confidence, and news of Garnett's injury is only more fuel to their fire. Looking at their matchups, I see Tyrus, Joakim, and Brad Miller giving Perkins, Mikki, and Big Baby Davis a tough time in the middle. However, Celts have the clear edge on the wings with Pierce and Allen. The point guard matchup is an interesting one; Rondo has had a breakout season, and also had the advantage in terms of playoff experience. Rose is a question mark, nobody knows how the rookie will handle the playoff pressure, but there's no question that he has the physical skills/tools to outplay Rondo. Rose and Tyrus Thomas are going to be the determining factors of whether or not the Bulls win, and I think it's their year to shine: Bulls in 7. Both these teams fumbled past the finish line. Orlando, losers in 4 of their last 6, is still without Jameer Nelson, and Rashard Lewis is dealing with lingering leg injuries. Philly, losers in 6 of their last 7, does not have significant injuries other than Brand,but simply doesn't match up well against he Magic. This series is going to be Dwight Howard playing "bull in a china shop" with the 76er's frontcourt. The Magic also have the advantage from behind the arc; Hedo, Lewis, Lee, and Alston will all have their turn lighting up the Sixers. Magic in 5. Dwayne Wade has taken the Heat a long ways. But for them to win this series, someone else from the Heat needs to step up. Jermaine O'neal, Michael Beasley, and Mario Chalmers immediately come to mind. The Hawks (aka Blazers of the East) are ready to prove that they're ready to take the next step as an NBA team. With Marvin Williams returning this past week from back issues, the Hawks also have a healthy lineup. Horford and Smith are going to give Wade a hard time around the rim, and despite monumental efforts, Wade isn't going to beat the Hawks all by himself from the perimeter. Hawks in 6. Other than Deron Williams, I would take the Lakers at every other position, and that's inclusive of the bench. Bynum is back from injury, Kobe wants that first post-Shaq title, and Phil Jackson's 10th finger has been missing a ring for too long (he's also got a pretty good track record against Jerry Sloan too). Lakers sweep. The stars have somewhat aligned for the Nuggets this season. Hometown hero Billups was shipped in via trade, Nene became one of the west's better centers in his first healthy season, Chris Andersen returned from suspension to be one of the league's top shot blockers, and J.R. Smith is maturing into a deadly assassin from beyond the arc. And let's also not forget that they've got Carmelo Anthony. Even with CP3, the Hornets do not have enough firepower to take down the Nuggets, and a non-existent bench. Nuggets in 6. As much as I hate the Spurs, I'm hesitant to bet against them in the first round. On paper, the Mavs seem to have a chance; Kidd, Dirk, Josh Howard, and the Jet give them more than enough firepower to take down the Black and White. The Spurs will also be without the services of Manu Ginobili for the rest of the year. That being said, they've played fairly well without Manu for the majority of the season. Roger Mason can, and will come up big for the Spurs, And you know you can count on Greg Pop, Duncan, and Parker to pull some thing crazy out of their sleeves; they always do. Spurs in 7. By far, this will be the most exciting matchup in the first round. The young blazers have finally grown up. Brandoy Roy, fresh out of the best season of his career, has matured into the go-to-guy and team leader. Przybilla and Oden, while both offensively unreliable, do all the things that the team needs from them on the defensive end. The Rockets have also been playing good ball; though T-mac is out(this may be a good thing), Yao has completed a whole season without any serious injuries. What this series comes down to is Roy vs. Artest/Battier. If Roy can overcome these two defensive hounds, then the Blazers will win. But seeing how the Rockets have not gotten past the first round for the past couple of years (with T-mac as the common denominator), I think they're going to come with some extra fire. Rockets in 7. The day has finally arrived. 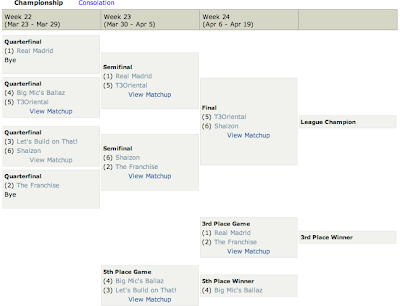 Fantasy Basketball 2008-2009 ends in mere hours, ushering in the start of the real stuff: playoff basketball. To generate some fan excitement, the NBA has released TV spots every year featuring some famous musician. Black Eyed Peas - Let's Get it Started made the Pistons' title in 2004 that much more memorable. After that, my memory isn't as clear. I believe Rob Thomas and the Pussycat Dolls each had their turn...but those spots didn't strike me as anything special. For this year, the NBA has teamed up with one of Hip-Hop's hottest artists Kanye West. Frankly put, this is exactly what the NBA needed. The beat, the autotune, and the lyrics all work to put some edge back into a league that's recently been accused of getting soft. Every year, I participate in a fantasy basketball league with some of my high school alum. We play H2H, standard 9 cats, 10 positions (PG,SG,G,SF,PF,F,C,C,Util,Util) with 4 bench spots. While normally pretty competitive, this league was especially competitive this year. This year also happened to be the first year we transitioned into a keeper league. Don't be fooled by all the wins you see. I started the season in the worst possible fashion; four huge losses to four eventual playoff teams. At the start of week 5, I was dead last. Deron's ankle was still messed up, Al Harrington gave me zeroes across the board for weeks, and Joakim Noah was a dud. The string of wins following the horrendous start weren't all that great either; I could only win 6-3 or 5-4, never really gaining ground on the front of the pack. 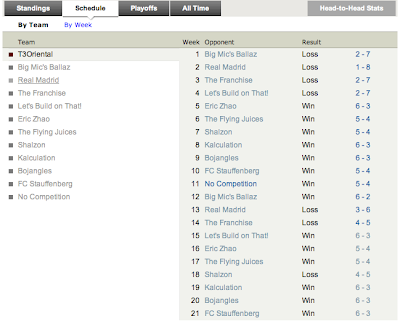 Spots 4-10 were separated by just 4.5 games (also note my league high 66 moves...I was streaming like it was my job). The fight for the playoffs was long and gruesome. And the time since hasn't been that much easier. That being said, my team has trucked it to the championship match. From last place to (almost) the top, this season has been one crazy journey. The championship week matchup is going to be tough; though I'm facing the 6 seed, he's got a stacked lineup (Kobe, Durant, Dwight Howard, Boozer, etc) and is also rolling. But win or lose, I'm chalking this year up as an accomplishment. I'm not going to miss any opportunity to sing praises about Air Jordan. Michael Jordan was inducted into the Basketball Hall of Fame oday. I propose we all allot Apr 6 as National Michael Jordan day, and take it to remember the greatest athlete in the modern era of sports. To MJ, I say thanks for all the highlights, records, and memories he's blessed us with throughout his career. It's a serious shame that future generations will never truly understand how Jordan transcended the game of basketball; they will never comprehend the full extent of his greatness. I would write more about how great Air23 was, but I'm going to leave that to the professional (and more eloquent) writers around the net. "True, Wilt Chamberlain was just as great in his day, and he didn't go into the Hall alone. Same for baseball and Babe Ruth. (And soon enough, golf is going to have this problem with Tiger Woods.) But even among those legends, MJ is different. And that needs to be recognized. Because as much as Jordan's getting inducted to the Hall of Fame is about basketball, his total contribution to the game and to the entire sports world is so much more than that. So much more than any other athlete can claim." "We can begin this examination of MJ's impact on the hoop revolution by underscoring his vast influence in marketing. The poster-ization process of Jordan's game quickly was seized upon by an extremely savvy sneaker and apparel company, embraced by a league that put its marketing emphasis on the back of its jerseys, and uplifted by the rise of the sports-highlight reality show. And, falling into lock step, we all pretty much whiffed on understanding the anti-gravity of MJ's greatness." "Michael Jordan goes into Springfield in September, and maybe they shouldn’t just give him a plaque – or even a wing. They should turn the whole building over to him. For one night, anyway, that should’ve been the plan. No shrine could ever do justice to his genius. You just had to be there." "For all the attention paid to Jordan's scoring, he's still the Bulls' all-time assist leader with 5,012. It's not easy for a shooting guard to control an NBA game. Point guard (because he establishes tempo) and center (because he controls the lane) are considered the crucial positions. But Jordan's skill set was so spectral, it defied labeling." The former Bulls coach paused, looking for the right words to sum it all up. Finally, he smiled and said, 'When Michael Jordan played the game, you couldn't take your eyes off him.' "
I'm not a sneakerhead, but these caught my eye. If you've been on the courts recently, I'm sure you've seen someone rocking the Nike Hyperdunks. Released last summer, these kicks have received much praise for their lightweight and excellent on-court performance. For this summer, Nike improved their design, resulting in the Nike Hyperize. Like the Hyperdunks, the Hyperize also implement Nike's Flywire Technology. These are supposedly even lighter than the Hyperdunks. Personally, I love how these look. I contemplated purchasing the Hyperdunks for a long time, but after seeing these I think I can refrain. The black/red colorway pictured appear much cleaner and more refined than its predecessor. Of course, I'll be waiting for some performance reviews before actually making the purchase. Hopefully these don't let me down. For more details, check out niketalk.com. Or just google it.